If you’re having knee replacement surgery this winter, you may have concerns about falling. With all the ice and snow here in northern Utah — and with you a little unsteady on your feet — you have a right to be worried about taking a tumble after surgery. So what will happen if you have a bad fall? Will you need to have revision knee replacement surgery? Falling shortly after your procedure poses a greater threat to your prosthetic implant than falling long after healing from knee arthroplasty. But since any fall can cause serious injury, it’s always a good idea to practice caution. The first several weeks following knee arthroplasty is the worst time for a fall. If you fall on your knee soon after surgery when your joint replacement is still healing, you may damage the prosthetic implant. In that case, you might end up needing revision surgery. Until your balance, flexibility and strength are improved, use your cane, crutches or walker and be extra careful when walking. Once you’ve healed from knee arthroplasty, your prosthetic implant is much less likely to be damaged by a fall. Implants are made of an incredibly strong titanium or cobalt-chromium metal alloy along with a high-performance polyethylene. So they aren’t easy to break. That said, 1 out of every 5 falls results in a serious injury. Each year, 800,000 patients are hospitalized because of fall injuries. Wear shoes with nonskid soles and low heels. Keep both of your hands-free for better balance. Avoid walking on wet, icy or snow-covered surfaces. Walk slowly and watch out for black ice. Make sure your home has plenty of light. Remove electrical cords, loose area rugs and other trip hazards. Do strength and balance exercises as recommended. Have more questions about knee replacement surgery? 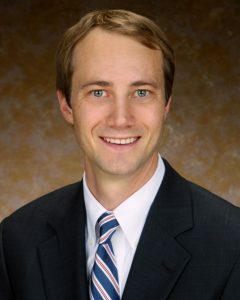 Dr. Trevor Magee, a fellowship-trained, board-certified knee reconstruction specialist based at Comprehensive Orthopedics & Sports Medicine, can provide you with expert answers about traditional and MAKOplasty robotic-assisted knee arthroplasty. With three convenient northern Utah offices — in Salt Lake City, Sandy and Park City — Dr. Magee makes it easy to get expert advice and effective treatment. For more tips and information on knee replacement surgery, schedule a consultation with Dr. Magee today. This entry was posted in Joint Replacement, Knee on December 20, 2017 by Trevor Magee, MD.